Figure 3.1. Cumulative fossil-fuel emissions and their redistribution among the three major reservoirs of the global carbon cycle over the period from 1920 to 2100 as modeled by two Earth system models (Cox et al. 2000; Dufresne et al. 2002). The left column represents the result of uncoupled simulations, in which changes in the physical climate system did not affect the carbon cycle, whereas results of the right column include such effects. The Hadley model (upper row; Cox et al. 2000) responds very sensitively to such feedbacks, whereas the carbon cycle within IPSL model (lower row; Dufresne et al. 2002) shows a much lower sensitivity. See also Friedlingstein, Chapter 10, this volume. Figure 3.2. Vulnerability of the carbon pools in the 21st century. Shown are the estimated magnitudes and likelihood for these various pools to release carbon into the atmosphere. The exact size of the circles is not known and the boundaries therefore have to be viewed as being approximate only. See Table 3.1 for more details. the outcomes and likelihood of a number of scenarios. Such approaches are most often used when dealing with systems whose dynamics cannot be captured with differential equations, and hence not encapsulated into numerical or analytical models. In this chapter, we adopt an approach that is similar to a risk analysis and attempt to identify the magnitude and likelihood of key feedbacks in the carbon-climate-human system. We focus on the major carbon pools and quantify the maximum fraction of these pools that are potentially at risk over the next two decades and over the next century. 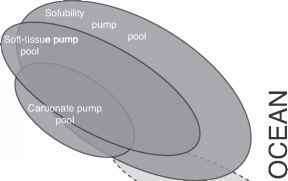 We contrast these results with the maximum sink strengths of these pools over the same periods. Although we take advantage of model results, we mostly rely on data-based analyses. This approach to quantifying vulnerability is inherently subjective and uncertain. 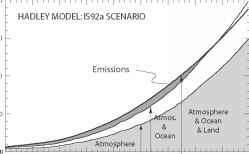 It offers, however, the possibility of going beyond the practical and sometimes fundamental restrictions associated with models and of including all pools and processes that are known to have the potential to influence atmospheric CO2. We would like to emphasize that we restrict our analysis here to those changes that affect atmospheric CO2. 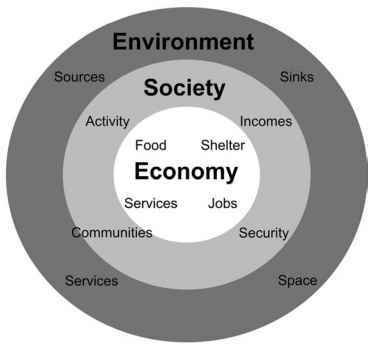 Other effects of human actions and climate change (e.g., loss of biodiversity and of economic activities currently and potentially related to it) may have impacts that are as large as or even larger than those on the carbon cycle, but they are beyond the scope of this discussion. 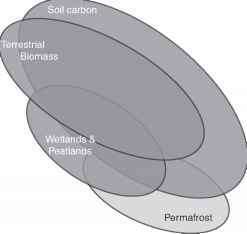 Figure 3.2 shows a summary of the vulnerable carbon pools, their magnitude, and the likelihood of the release of the carbon stored in these pools into the atmosphere over the 21st century. This figure is based on the detailed information in Table 3.1. Several key carbon pools may be vulnerable over the timescale of this century. The total amount of carbon stored in these pools is very large, two to five times as large as the total carbon in the current atmosphere. If a substantial fraction of the carbon in these pools were released to the atmosphere, the consequence would be a major increase in atmospheric CO2 and hence a severe reduction of the anthropogenic CO2 emissions permitted, if the atmosphere is to not exceed a certain target CO2 concentration. As discussed in detail later in this chapter, we expect the magnitude of potential releases to increase with increasing stabilization targets, as the higher targets tend to be associated with a larger climate change. The potential release of carbon from these pools has to be viewed in the context of the sinks for atmospheric CO2, which will probably continue to operate through the 21st century, although likely with gradually falling efficiency (Schimel et al. 2001). Because the potentially vulnerable pools are large, and because they can be rapidly mobilized for release, we believe that the majority of the feedbacks within the carbon-climate-human system are positive—that is, that they lead to an acceleration of the greenhouse gas—induced climate change. This conclusion does not take into account the possibility of surprises. A small number of very large carbon pools may become vulnerable during the 21st century, especially the carbon stored in the very deep permafrost soils in Siberia and Alaska and the carbon stored in methane hydrates (Figure 3.2). Although we view the release of large quantities of carbon from these two pools as very unlikely, scientists' present understanding of the dynamics and controls of these two pools is insufficient. Note: T = temperature; R = respiration; Ra = autotrophic respiration; Rh = heterotrophic respiration; NPP = net primary production aWe define vulnerability as the maximum part of the total carbon stock that could be released into the atmosphere over the time scale indicated. While the past 10 years have seen a large increase in the understanding of the present-day global carbon cycle and its anthropogenic CO2 perturbation (Sabine et al., Chapter 2, this volume), scientists' understanding of how the carbon cycle will evolve into the 21st century and how it will interact with human actions and the physical climate system is overall still poor. This chapter is intended as one step on a long road to accurately incorporating the full suite of carbon-climate-human feedbacks in numerical models. In assessing the future dynamics of the global carbon cycle, the natural starting point is the current status of the carbon cycle. This aspect is extensively reviewed by Sabine et al. (Chapter 2). We, therefore, concentrate only on those aspects that may cause a change in the carbon cycle over the next 100 years. In the next sections, we first briefly review the expected future trends in the climate system under typical IPCC scenarios. From these changes, we attempt to determine the strengths and vulnerability of the land and ocean carbon sinks in the 21st century.